While wandering around in Barcelona, in the heart of the city, it's highly possible to come across a wonder of art designed by Antoni Gaudi. Even if you have decided to discover the city without any tour or city guide while walking around in Barcelona streets you may see many fascinating buildings which ring a bell in your minds that the buildings are really worth to see. So without wasting time you should pop in these amazing buildings as most of them were possibly designed by magnificent Catalan architecture Antoni Gaudi. So Casa Mila in other words La Pedrera ( a quarry) is located in the city centre. 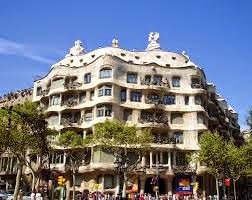 If you walk through the street called La Passeig de Gracia which hosts many chic and expensive brands to shop, you will come across Casa Mila on the corner of Exiample district. The idea of building a house resembling an art of work came up with Pere Mila who was rich thanks to his widow wife and hurted for living in a noble district in Barcelona city. So the history of Casa Mila started at this point in 1905. Barcelona Casa Mila was started to be designed and built in 1905 by Antoni Gaudi. He was assigned to build this fantastic and noble house by Pere Mila who met Gaudi while Mila was visiting a friend of his father to talk about business. Casa Mila was designed and constructed for the married family members Pere Mila and Roser Segimon. She was a prosperous widow of Josep Guardiola who was an Indiano. In the history because of this wealthy situation, Pere Mila was criticised as no one could be sure whether Mila was in love with Guardiola's widow or widow's Guardiola. No matter Pere Mila thought, at the end, an astonishing masterpiece had arisen in Barcelona history. 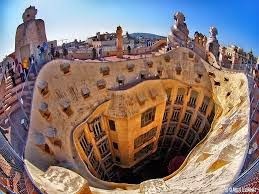 So we should be thankful now as we are able to have an eyeful thanks to Pere Mila's idea and of course Gaudi. The construction lasted about 5 years to complete. Not all Gaudi's style but most of them in his project plan were stayed with. So again in this project we see many shapes or parts symbolizing Catholic world devoted Virgin Mary. Earlier, we mentioned about that some figures and symbols of Catholic religion were extracted from the project plan by city hall of Barcelona after Semana Tragica occurred in 1909 in Barcelona city which caused massive bloody scenes. The action was carried out for anticlericalism in Barcelona. In 1940 when Pere Mila died, Roser Segimon sold the building but she continued to live in the main floor until she died in 1964. Until 1984, the house was used for different purposes and it experienced lots of changes. After a while, Casa Mila started to live the destruction but fortunately in 1984 Casa Mila was thought as a part of World Heritage Site and sooner City Council started restoration of Casa Mila Barcelona. The restoration job was given to architectures named Joseph Emilio Hérnandez-Cross and Rafael Vila. When you walk around in the house you will be charmed by the paintings with the references to mythology and flowers. While you try to figure out these paintings you may want to check the big iron gate built for access of cars and people. In every inch of the house you will feel the perfection provided by Gaudi. In the attic where a laundry was active once, you will taste museum atmosphere with enjoyable lighting. While people glorify Casa Mila Museum in each visit, there have been many people criticizing the house in the history. Firstly, people living in Passeig de Gracia had complained about that the house caused real estate market's prices got lower. Others complained about how balconies were difficult to restore. Some gave a nickname as Pedrera. Whether Casa Mila were compatible with interests of people or not in the history, we are really thankful for this marvelous building standing in the city centre. What Can You Do in Casa Mila? While you are visiting Casa Mila you will be astonished by the furniture designed for the house by Gaudi and you may want to have a look more than once. Don't forget to spend time at roof and in the museum showing how this building became an art of work in time. Apart from this activity, you can attend music night organized in Casa Mila. Also, there is a great restaurant offering you delicious Spanish kitchen you may want to taste during your visit. As you see Barcelona city lovers, there is much to discover and taste. So we recommend you follow your Barcelona city guide. We will keep on informing you about every part of this lovely and breathtaking city. Barcelona city tour guide will be with you as long as you want. Have a nice tour at Casa Mila. There is an entrance fee around 18€ per adult. You can give your belongings in the entrance for a fee like 1€ so that you can tour the house in much more comfort and you can get back your money as soon as you take your belongings back. The menu at the restaurant charges around 25€ which enables you taste delicious Spanish food. Like in many museums, Casa Mila is quieter in the mornings. You can keep in touch with us for your questions about Barcelona city travel guide. 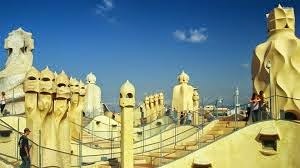 Here below there is a video to have a look at Casa Mila before you plan your Barcelona city travel.